Originally from Llandrindod Wells in mid-Wales, I’ve spent most of my adult life as a resident of leafy Leamington Spa in the county of Warwickshire in the heart of England. I live with my partner, Michael Barker, who works for a large insurance company as a claims negotiator. We’ve been a couple since July 2001. Michael lived in Rugby until 2004 when we found, fell in love with and bought a terraced Victorian townhouse in Leamington, finally moving in together on April 16 of that year. 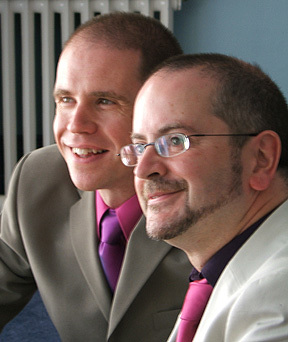 On July 20 2006 (our fifth anniversary) we registered our civil partnership in a ceremony at Warwick Register Office. See some more photos from our partnership ceremony. Read the saga of how our paths crossed and re-crossed for twelve years before we finally got together.